First, let me acknowledge that a steak is not a “spirit” according to any reasonable definition of the word. Still, steak accompanies a cigar in such an excellent way that I feel perfectly comfortable including steak in our Spirits category with scotches, bourbons, and rums. 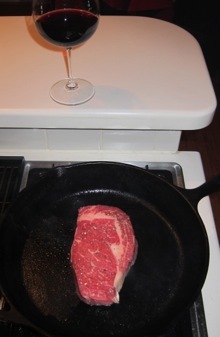 While I don’t usually smoke a cigar while eating a steak, a well-cooked steak and a glass of wine are pretty much always the prelude to a cigar. Something about the savory nature of a steak and a glass of wine (a good Rhone, Bordeaux, or California cabernet) just begs for a good cigar. To that end, I’ve been cooking steaks for a while now and I have a few tricks that make my steaks extra tasty (and worthy of an after-dinner cigar). What follows are my personal tips. Most important is picking the right steak. While filet mignon is a great cut of meat (especially at a steakhouse), when I’m cooking I prefer a ribeye or strip steak, both of which have more fat (and thus more flavor). Steaks are graded on their marbling, and while Prime are the best cuts (and the most expensive), Choice cuts offer excellent quality for the price (the next level down is Select). A good Choice cut at least one inch thick is perfect. Next, season your steak with salt and pepper. Let it get to room temperature before you cook it (this is important), then liberally apply course salt and pepper just before cooking. Forgo the grill and instead use a combination of a cast iron skillet on the stovetop and the oven. Pre-heat the oven to 450 degrees and simultaneously heat up a cast iron skillet, the hotter the better. Brown each side of the steak for a few minutes (until it begins to blacken) in the dry, hot skillet (without butter or oil). Then finish it in the oven until it firms up (only a few minutes is needed if you like your steaks medium-rare like I do). Pull it out of the oven quickly then let it sit for five minutes. It will continue to cook while you wait. The result is an excellent, tender, flavorful steak that’s blackened on the edges while still rare and juicy in the middle. Accompanied with a nice glass of fine wine, there is no better prelude to a good cigar. Cooked right, it’s as good as any steak you’ll have at an expensive steakhouse and it’s the perfect introduction to a fine medium- or full-bodied cigar with a scotch or bourbon. So really steak is the appetizer, and the cigar is the main course. Amen to that! And then have another steak for dessert. Tasty article. I believe I'll be cooking up a couple steaks tonight and firing up a cigar. I deserve it. Being from Washington state, I have to put in a plug for some of our cabs and syrahs, as well as Spanish Monastrel and Argentine Malbecs. I prefer to pepper my steaks after cooking, since I'm not a fan of burnt pepper. Don't overlook the hanger and flatiron steaks. Nice post, I also like to use the pan method. how can we contact you or patrick s about a problem?